Crape myrtle trees are a wonderful addition to your home or business landscaping, especially here in Gainesville, Florida. 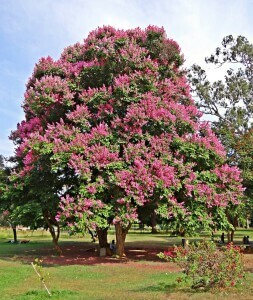 These ornamental trees not only tolerate the water shortages and excesses of north Florida well, but are also quite robust, so you won’t have to worry much about insect or disease problems. While crape myrtles are fairly low-maintenance for the visual payoff (profusions of pale pink, fuchsia, purple, red, or white flowers), they do require pruning in order to maintain an attractive shape. Proper pruning early on is vital, as it will determine the shape of the mature shrub and cannot be corrected drastically later on. Depending on where the tree is located, say near a walkway as opposed to in a garden, it will need to be pruned differently to achieve the desired structure and aesthetic. Avoid pruning your crape myrtles in fall; they will not only look less attractive while bare for the winter, but will also be more susceptible to freeze damage. Leaving the excess growth through the winter provides a safety net of sorts. The time to prune your crape myrtles is around mid-February, when they are less likely to be damaged by low temperatures, but are still dormant. With ornamental trees and shrubs like crape myrtles, pruning is key to establishing an attractive shape. If you are not knowledgeable about pruning crape myrtles, leave it the experts at Mr. Tree and Lawn Service. Our Gainesville tree care and lawn maintenance company will help you keep your lawn and garden looking great with experienced, professional, and affordable service you can count on.